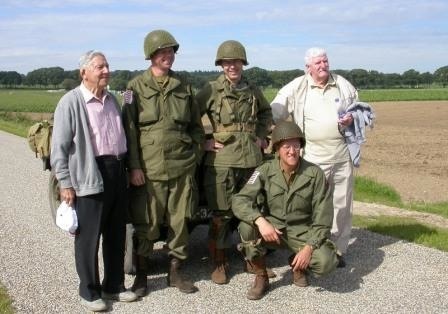 With precious little time to prepare, just like it was sixty years ago, Cor and Harry decided it would be a good idea to visit the former Market Garden dropzones of the 82nd Airborne Division near Groesbeek and Overasselt this year. Cor was able to arrange for three M-43 pants to be 'rigger modified', i.e. 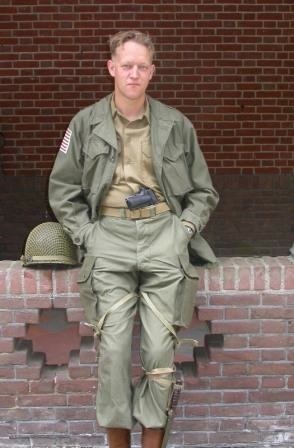 he had M-42 type cargo pockets made out of tentage sewn on to them. Also he was able to arrange last minute for some excellent billets in Berg en Dal, a lovely little town right in the middle of where the action was so long ago. Harry, Béatrice and Cor, with our jeep Swee'pea, got there in the afternoon of September 17 and I got there the next day. The weather was gorgeous, as good as it was back then. 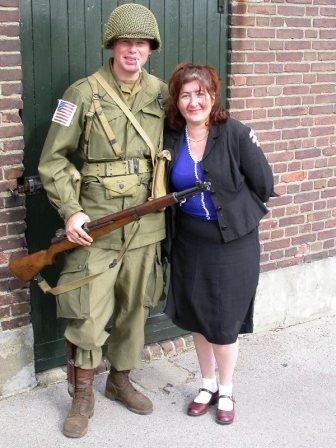 Us guys got dressed up in our 1944 airborne gear and Beatrice in wartime civvies. Armed with a large scale map we set out to find those former dropzones. Our best guide was a book published in 1977 by Norbert A. de Groot. For Cor an me this book was the main culprit of our becoming infected with the green disease. It is called 'Als Sterren Van De Hemel' (Like Stars From Heaven, published only in Dutch as far as I know) and describes in detail the Market part of the battle in the Nijmegen area. This allowed us to broadly trace the steps of the various units involved. Today the lovely almost 'un-Dutch' landscape, with gently sloping hills, shows little of the fierce fighting that once raged here. 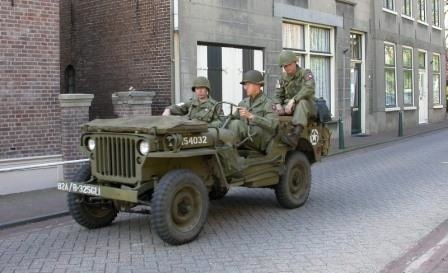 But if you are in a 1944 U.S. Army jeep with 82 A/B markings and are dressed as 1944 airborne troopers and you talk to the locals you get stories and you understand why so few buildings predate world war 2 in some areas. The parachute and glider troops quickly gained ground when they landed September 17, 1944 without a lot of damage. But in the ensuing counter attacks whole villages were razed to the ground and turned into ghost towns, by artillery, both U.S. and German. We visited a farm that looked pretty authentic still, called the Wolfshage, but when we asked permission for some photographs the owner pointed out the difference in bricks. And indeed hardly noticable but two feet off the ground the bricks were different. The bricks below were all that were still standing after the battle. But the rebuilt farm looked nice and the owner and his family were very friendly and interested in our jeep and uniforms. So we got our shots and when grandpa arrived he told us that there were gliders in the fields left and right, right up to the farm. This farm was smack in the middle of dropzone?? on the edge of a community called Klein Amerika (Little America). General James M. Gavin landed in the lower left corner of this dropzone. Right next to a peculiar triangular wood that is still there. With the help of our book and maps we traced the hunting lodge where Mrs. Dora Visser repaired the jump pants of Lt. Rex Combs. We did not go as far as ripping up one of our M43 pants but we did recreate the picture of Combs just outside of the porch of the lodge. One of the most beautiful and remarkable features in the area is the heavily wooded area around Hill 75.9, commonly known as the Duivelsberg (Devils Hill). At the time it was known by its German name Teufelsberg as it was part of Germany back then. In 1940 German troops hid in these forests in preparation for the attack on Holland May 10. On September 19, 1944 Lieutenant John Foley was ordered to take the hill with his Able Company to gain control of the road at its bottom and thus prevent German troops from coming into Holland. Around five o'clock the American troops crossed the road leading into the city of Berg en Dal and thus into Germany. In fact these were the first American troops on German soil. Soon they reached the bottom of the hill and the trouble started. Two flanking manoevers were brutally stopped by heavy machine gun fire inflicting heavy casualties. Lt. Foley decided to storm straight up the hill. Screeming like mad devils they took the hill and withstood several heavy counter attacks. In 1949 a few border areas, including the nature reserve around the Duivelsberg were annexed by Holland as repayment for the damages done by Germany during the war. After the border treaty of 1963 most of these were returned except for the Hill 75.9 and the surrounding area. A comparison of a modern map with a 1944 Army Map Service edition of GROESBEEK clearly shows the changed border.